Chris Belcher put on a show on Wednesday, but he’s not done yet. 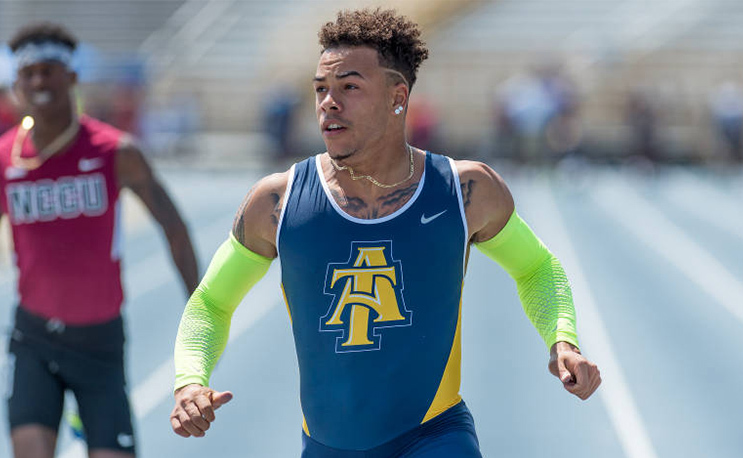 North Carolina A&T’s trip to the NCAA Track and Field Championships got off to a blazing fast start on Wednesday. Sprinter Chris Belcher put on a spectacular show at Historic Hayward Field in Eugene, Oregon on Wednesday, qualifying for both the 100 and 200 meter finals on Friday in addition to being a part of A&T’s 4×100 team who advanced to the final as well. He will have a chance to go for national titles in all three events on Friday. Belcher started off the night by helping the relay team run a 38.48 in the 4×100. It was the second fastest time in the nation as Auburn’s squad edged them with a 38.47. They will go up against Oregon, Texas A&M, Auburn, Houston, LSU, Arkansas and Texas in the final at 8:32 pm on Friday. Next up was the 100 meters, where Belcher ran a 9.93. It was only the third fastest time on Wednesday but the sixth fastest collegiate time ever. Belcher won his heat and claimed All-American honors and will go for that title at 9:22 pm on Friday. Belcher also won his heat in the 200 meters, running a personal record 20.01, and just missing the MEAC’s all-time record by one-tenth of a second. Again, Belcher earned All-American honors and will race for the national title at 10:07 p.m. on Friday. A&T’s India Brown will look to qualify in the 100, 200 and 4×100 as well on Thursday and sophomore Kayla White will compete in the 100 meter hurdles and the 4x 100.